An efficient way to familiarize yourself with instructional strategies appropriate for the ESL class is to work with the Teacher Training Through Video series, published by Longman, Inc.
Below is a list of the techniques covered in the video series, with a brief description of each. 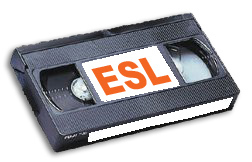 A User's Guide, appropriate for the professional development of ESL teachers, accompanies each video. Beginning Literacy shows teachers how to group pre-literate, non-literate, semiliterate, and literate students in the same classroom to teach reading and writing skills. Various grouping strategies and instructional approaches based on students' backgrounds, goals, interests, and learning styles are presented as important aspects of literacy instruction. Dialogue Drill is an outgrowth of the audio-lingual method. It is used to develop speaking skills and pronunciation accuracy. The Dialogue places language structures in a context. The Drills emphasize the teacher as a model that students mimic in order to practice grammar, pronunciation, and vocabulary. Early Production comes from the Natural Approach, which focuses on meaningful communication rather than on the form of the language. Early Production emphasizes comprehensible input and is characterized by activities that require one- or two-word responses from students in the early stages of language learning. Focused Listening presents listening skills as strategies to bridge the gap between classroom English and the English encountered outside the classroom. Information Gap instructs the teacher in how to develop activities that encourage students to communicate with each other in order to close a "gap" in the information they possess. The technique emphasizes the importance of real communication in the learning process. Language Experience is designed for preliterate, non-literate, and semiliterate students to learn to read what they can already say. The technique emphasizes the concept that print represents spoken words. In this technique, students learn to recognize their own words before approaching other kinds of reading. Lesson Planning demonstrates how to plan an effective ESL lesson. It focuses attention on identifying the language skills that are the primary objective of the lesson. It also demonstrates and provides practice in developing the six stages for an effective lesson plan: Warm-up/Review, Introduction, Presentation, Practice, Application, and Evaluation. Life Skills Reading provides practice in extracting information that will assist the reader in performing crucial tasks in the workplace or in daily life, using items such as ads, bus schedules, and employee handbooks. Narrative Reading addresses reading in paragraph form, as in stories, textbooks or newspapers. The technique focuses on global understanding and on the development of reading skills. Problem Solving helps develop communicative competence and critical thinking skills. It uses students' concerns and problems as a subject for discussion. Students practice language skills by making informed decisions based on a variety of solutions and their consequences. Role Play provides students with the opportunity to deal with the unpredictable nature of language. The technique develops students' skills choosing verbal and non-verbal communication strategies in various contexts. Total Physical Response (TPR) demonstrates how to conduct a lesson based on the principle that listening naturally precedes speaking. During TPR activities, students listen silently to commands and respond non-verbally. Co-operative Learning is a series of four videos that instruct the teacher in how to set up language learning activities that provide opportunities for students to interact with each other in groups in order to build teams and promote individual accountability and positive interdependence.